Linden Etymology: from Latin "Tilia". Its German name, "Linde" is at the origin of the name of the botanist (Swedish) Linné (in Sweden, he was known as Linnaeus). Origin: two European species, the Littleleaf Linden (Tilia cordata) and the Broad-leaved lime (T. platiphyllos). The Linden of Holland (Tilia x vulgaris), also called intermediate Linden, is a natural hybrid of Tilia platyphyllos and Tilia cordata. Crimean Linden, Tilia x euchlora (toothed leaf). 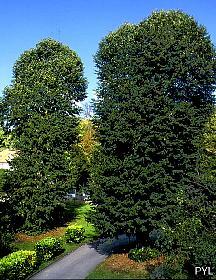 Habitat: Lindens are tress of light or half shade. They accept limestones, in humid atmosphere with the beech, the pubescent oak and the sycomore maple. They sucker from roots. Hardiness: zone 6 (Lindens support cold until -23 °C or -9 °F). Form (insulated tree): broad, densely twiggy, rounded crown. On old trees, the low branches fall down and the crown spread. At distance, this outline is characteristic. The Silver Linden has ascending branches. Smooth, light grey bark on young subjects, cracking by forming bumps on elderly plants. Deciduous foliage. Leaves are alternate, distichous (like charm, beech, elm): they pick up so the maximum of light. In summer, aphids stuff themselves with the sap and reject a honeydew sticking on leaves. These sometimes dry out prematurely. Leaves are cordate (cordata), slightly asymmetrical at the base, glabrous, except the silver linden or "tomentose", with tufts of hair in veins, and toothed. Flowers: in pendulous clusters from 2 to 10, with a long pale green bract, very odorous, in May-June. Stamens are numerous and united at the base in several bundles; this soldering type is, even more marked, to malvaceae; the anther opens by two cracks. Five carpels are welded and contain each two ovules. Fruits: Small balls of 0.3 cm, grouped by 2, 3 or 4, and fitted with a wing that facilitates their spread by wind. The fruits of lime from Holland are bigger, stronger wall and ribs more prominent. Legends and traditions: the masks of the sarcophagi of Fayoum (Hellenic epoch, in Egypt) were in linden, what points out a sacred character of this tree in the ancient time. In Greek mythology, the nymph Philyie conceived with the father of Zeus a monstrous child, and, of shame, was completely transformed into linden. The linden is also the female incarnation of Baucis, a poor villager which welcomed, without knowing it, Zeus dressed up as vagrant. Her husband, Philémon, reincarnates in oak. At Germen, the linden was also of female character, since it was devoted to Frigga, goddess of fecundity and of maternal love. Christian religion grants in the linden a sacred character, due to the smell of its flowers. Linden was planted near churches in the Middle Ages. Uses: The linden wood is white and soft, its grain is very fine, but it does not resist well humidity. It is used to fabricate frameworks of pieces of furniture, picture frames, hoofs, printing boards, pencils and matches, piano keys. It can be sculpted and turned very well. It can also give with the wood pulp. It burns badly, but its coal is used for the manufacture of charcoal and powders. From the bark, were extracted fibres, teille, which, by retting, made ropes, mats and coarse fabrics. Flowers contain a narcotic for insects. The infusion of flowers is a comforting, antispasmodic and febrifuge. Even if it is fluently made, it is not recommended to leave bracts in the infusion. For the XVIth century (notably at the instigation of the minister Sully), lindens are planted in the public gardens and in street alignment, because they support pruning, and this long before that occurs fashionable avenues of plane trees and chestnut. It is also possible to guide them in fruit-wall, "espalier" (center of Amiens). The Silver Linden is resistant to pollution. The most resistant (and currently employed in the city) is the Tillya pallida because it is insensitive to attack by mites: it shelters under its leaves auxiliaries predatory mites. Linden henrya, named according to Augustine Henry (1857-1930), doctor, Irish botanist, who crossed China and Formose. Small, ruffled leaf of hairs, fine on the margin. Its leaves have the size of those of the linden with small leaves, but they are recognizable with the small thorns which edge its periphery. Crimean Linden, native to the Caucasus, recognizable with three toothed lobes of its leaf. Its fruits are bigger than in other lindens (0,5 cm in diameter) and veined on four meridian lines.